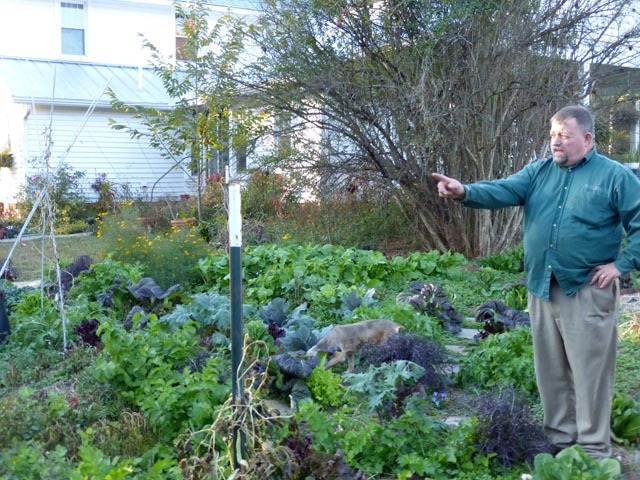 Rodger Winn and his wife Karen grow seeds for Southern Exposure, as well as vegetables for themselves and for a local market, in their 1.25-acre garden in Little Mountain, South Carolina. On our recent trip to the Carolina Farm Stewardship Association Sustainable Agriculture Conference in Greenville, SC, we stopped in to see their place. 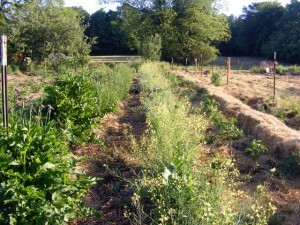 The area had just had an unusually early frost and snowfall, so the summer crops were dead, but the fall garden was green and gorgeous. Rodger showed us several seed crops, including Charleston Hot pepper and Charleston Gold rice. (We haven’t gotten the rice seed from him yet; it’ll go up on our website after we do.) 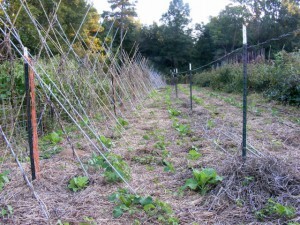 We also found his bean trellising quite interesting. It uses thin fiberglass poles kept in place with wire from an old fence. The space under the poles is not very high, but it’s high enough for a person to crouch and pick beans in the shade. But the most interesting part of seeing the Winn farm was Rodger’s description of how he uses clover and straw to smother out weeds so that he needs neither a tractor nor herbicides. 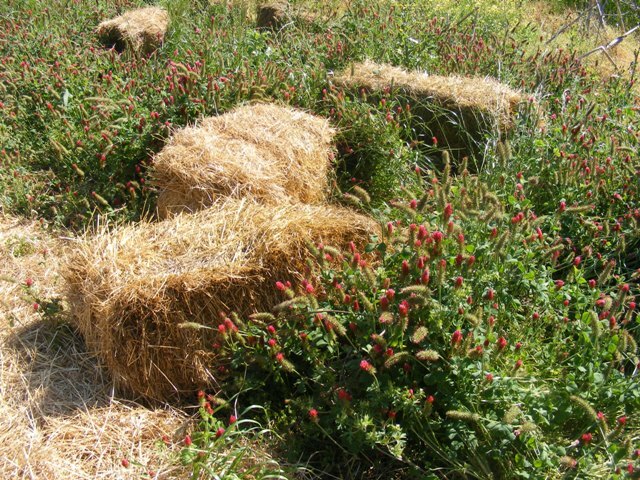 In fall, around the time of his first frost, he broadcasts Crimson Clover over his main garden area. 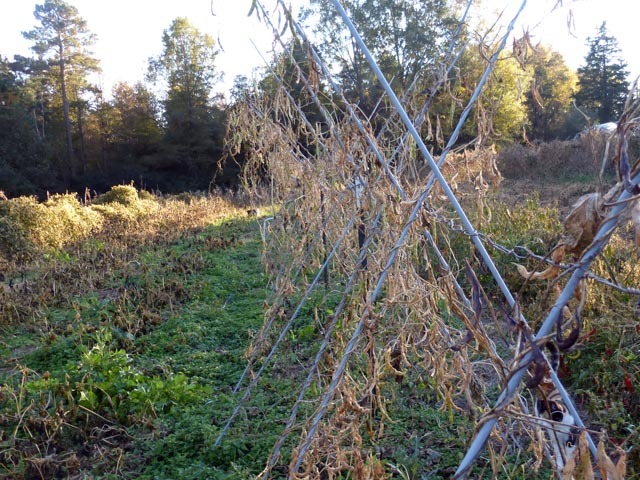 Last year the Winns’ beans finished in August, drowned by a very wet summer, so he planted collards in the same row as the beans without pulling up the drip irrigation or the poles, as seen below to the left. That January, he pulled up 40 of the best remaining collard plants and replanted them at the top of the garden, where they bloomed in late April of this year and produced seed, as seen below to the right. 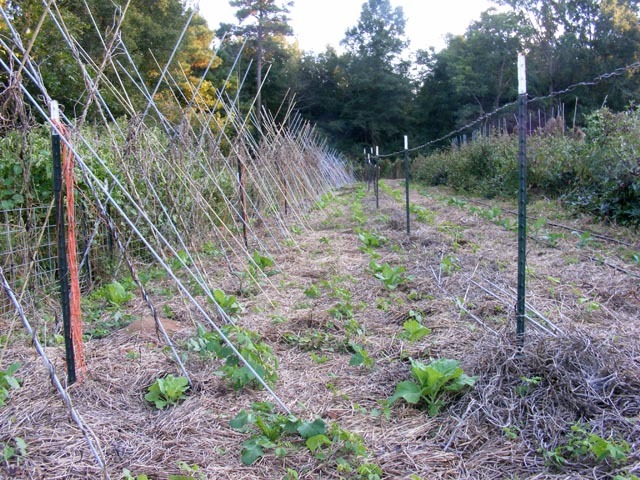 For the Winns, going no-till is a great way to save time in the garden, as they don’t have to hoe or thin most of their crops, or ever bring a tractor into the garden. They also don’t have to remove trellising and drip irrigation as often as farmers who till. The method also builds great soil. 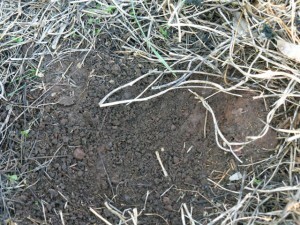 In 1998, the farm had hard red clay soil. 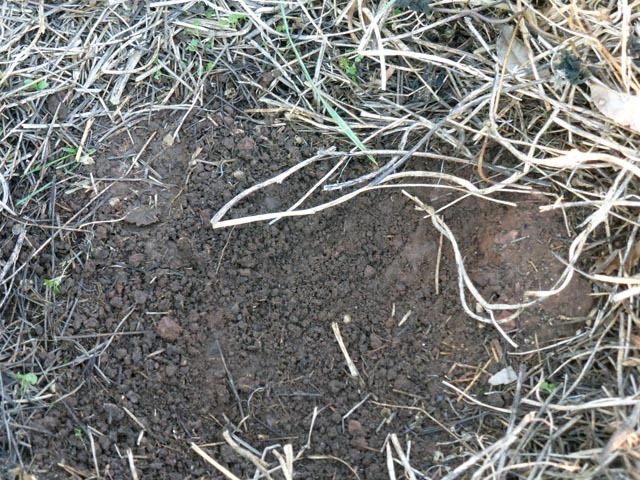 Now, while the subsoil is still hard red clay, the topsoil is a rich, dark loam created by sixteen years of nitrogen-fixing clover cover crops, ten years of thick, carbon-rich hay mulch, and three years holding nutrients in the soil by not tilling. We’re excited to try out a system like Rodger’s on our own farm, but with many other projects on our plates, we’ll probably start it on a small section of our land, with hopes of expanding it to cover larger sections of our gardens in the future. You can read more about Rodger and his love of heirloom seeds in Bill Best’s book Saving Seeds, Preserving Taste.